I used to be a perfectionist, always needing to be perfect, never thinking I was good enough, trying to prove to myself that just being me was okay. It’s been a process to be able to accept myself, as it is for most people. The wonderful thing is that, now that I know I’m ok, I’m freed up to see the perfection everywhere around me. I couldn’t see it before, being so focused on myself. Let me give you an example. Yesterday, my co-author Brandi Rarus and I were interviewed about our new book Finding Zoe on Good Day Google Plus, the Hangout On Air hosted by Chef Dennis Littley. We had technical difficulties. Before the show, Brandi’s sign language interpreter (Brandi is deaf) kept breaking up. We tried helping her to remedy the situation for an hour before the show, with no luck. It was difficult, because if Naomi McCowen—Brandi’s interpreter couldn’t be on the show then Brandi couldn’t either, since she needed Naomi to interpret for her. It was stressful. But the show must go on, so Brandi, who had been texting with me, wrote, “Knock ‘em dead,” and Dennis and I went live. I quickly gained my composure. Dennis explained to the audience, that if Naomi worked out her technical problems she and Brandi would join us. I was really disappointed. But I launched into the interview, realizing that I could use the difficulty to my advantage. One of the points I’d wanted to make during the show was how deaf people often have to work much harder than hearing people in order to succeed—concerning things that hearing people take for granted. Because of the difficulty, I was able to point out a real live example. How perfect was that? Then to my surprise, Naomi and Brandi appeared on the screen. Dennis, not missing a beat, began asking Brandi questions, which Naomi interpreted for her, and an amazing conversation began taking place. Naomi was still breaking up, making it difficult to understand her, at times. But somehow the audience—and Brandi—understood her well enough to keep the conversation going. It was a wonderful show. Everyone loved Brandi. But Naomi was the real hero. The audience appreciated the amazing job she did interpreting for Brandi under very difficult circumstances. What had appeared as a problem, actually made the show better. I’m not only talking about making lemonade out of lemons, but about seeing how it all worked out magnificently. The takeaway? 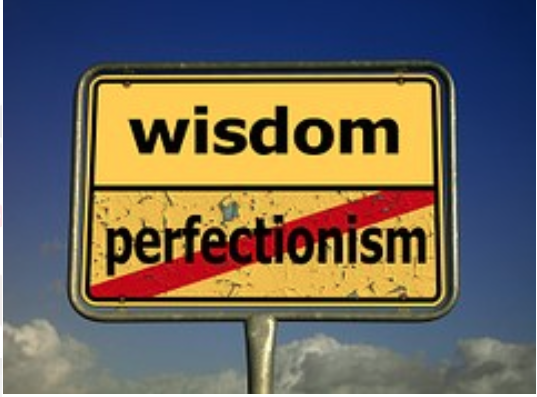 If you’re trying to be perfect, switch objectives—and look for the perfection that’s all around you. Tweet This In the conversation you had with your partner. The billboard you saw on the road. The phone call that came at just the right time. When you do, you’ll know that you’re part of that perfection, and that you must be perfect, too. I LOVE this article. Everything turned out perfect even when it seemed all was not in order as to plan. I find life mirrors this on many occasions. Like you say Gail, switch objectives! Congratulations to you Gail, Brandie and Naomi on your interview about Finding Zoe on Good Day Google Plus, with Chef Dennis Littley. I look forward to watching it later today. Thank you Debra. I really appreciate you taking the time to read in the first place. And I love how we resonate with each other on the things that matter to us most. Our friendship is another example of the perfection. As you say life mirrors this on many occasions, and here is just one more to celebrate. I celebrate you, every day. You are so close in my heart. Thanks for the congrats about the show. I hope that you enjoy. See you soon. It was my pleasure!!! And I got a great blog post out of the deal, to boot!!! I’m so glad that the piece spoke to you, MicheleElys. Thanks for weighing in, as always. I love what you added, “Things turn out best,for those who make the most of what turns out.” It is so true. And also Tweetable. See you. Hope you are feeling great. What a perfect example of this quote. I find that the perfection we so eagerly desire actually comes when we let go. This is a process I strive to be conscious of every day. I absolutely LOVE how what appeared to be a less the desirable experience, turned out into a living example or teaching moment for all of us to understand a little bit better the world of the deaf community. Bravo to you all for remaining graceful under pressure! When we learn to let go and let God, all works out to the higher good for all. Thanks for taking the time to comment, Christine. I knew you of all people would understand what I was saying. You are right. When we learn to let go and let God, all works out to the higher good for all. Amen. The awareness of that is everything!! Love and light to you, my angel.